Newly bought pet fish are usually infected with disease and they are best placed in a quarantine tank to monitor for any health problem before released to the main aquarium tank. There are several methods for performing health quarantine such as using common fish salt bath but usually just placing them in a solitary confinement is good enough to check whether they might be harboring potential harmful fish disease. Although this can serve as a precautionary step nonetheless all these can be avoided if you practice selection of the best fish bought from a pet store which maintains clean water condition and carefully taking care of their inventory. Normally, depending on how the fish were placed in the display tank and how often the waters are changed, it can greatly affect on how healthy the fish that are offered for sale. Fish diseases can be problematic because it can cause stress both to the pet and the owner. There are quite a number of commonly known diseases such as mouth and fin rot, worm infections, ick, bloating flip over condition and the most dangerous is fluke disease. Depending on severity and level of infection on your new pet fish, some are pretty hard to cure with no progress in sight. More fish will end up dead without proper treatment. Sometimes even some of the basic common sense rules were ignored such as applying the right medication and ignorant pet owners will often take things easy until it was too late. Another main criterion towards creating healthy living pet condition is by controlling the fish population. Number of fish can increase due to breeding or addition of new pet but everything must be leveled up by having an extra tank or changing to a larger sized aquarium. 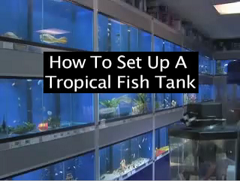 One of the common mistakes is to over stuff all your fish thinking that this is fun but however, the water will foul up easily since ammonia and nitrite level can shoot up immediately because an aquarium is a closed system.